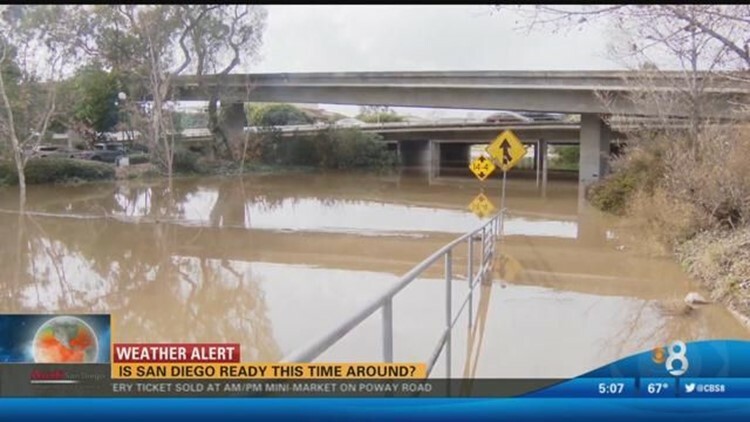 El Niño: Is San Diego ready for the upcoming storms? February was one of the driest in San Diego history, but the outlook for March looks very wet. SAN DIEGO (CBS 8) – February was one of the driest in San Diego history, but the outlook for March looks very wet. The big storms in January caused several problems throughout the county and on Wednesday, Ocean Beach residents began to prepare for the upcoming storms. Crews have begun working on clearing storm drains, checking pipes and distributing sandbags. This time around, instead of distributing sandbags at just fire departments, sandbags will also be distributed at some city parks. Crews spent the past few weeks preparing for the upcoming storms which are expected to bring several inches of rain to parts of San Diego. “We've done everything to clear the drains out from the last two storms. I think we've gotten to them all. We've been checking channels, we've been fixing channels, fixing pipes, and we initiated more emergency pipe repair projects than ever before. We've been doing our part to really get together,” said Bill Harris with the City of San Diego. In the past, some of the problems were caused by tree trimmings or yard scraps that blocked flood control, and a month ago during strong winds, debris was tossed city-wide. Most of that has now been removed and never made it into the storm drains, but some homeowners may still have scraps form private work lying around that needs to be cleared. “If you are going to be doing yard work keep your materials safe and secure because they can ruin an entire neighborhood. Pick up your trash, keep the lids on the trash cans and whatever you do, make sure you call it in early,” said Harris. Firefighters have distributed more than 70,000 sandbags this winter and the city said its department has coordinating plans for the upcoming weekend storm. Even with all the preparations, some flooding is inevitable. The city said it moved the sandbag distribution to parks to provide regular hours because previously they were distributed form fire departments that went unstaffed during emergency calls.